Quick and Easy Vegetarian Dinner. Shred curly kale and saute with garlic. Saute mixed heritage tomatoes with garlic and thyme. Cook Sunny Queen Vegetable Frittata, serve over the tomatoes, with kale to the side. 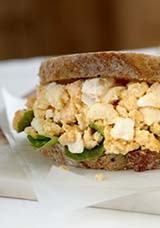 Creamy Egg Salad is a firm favourite, and using Sunny Queen Smashed Egg could not be easier. Mix Smashed Egg with chopped dill, aioli or mayonnaise. Season to taste and garnish with more dill. Serve by itself or with crusty bread. This simple but delicious roulade is made with sauteed spinach or silverbeet, grated cheese and Smashed Egg. Roll filling into puff pastry and slice into individual portions. Bake until golden and cooked through. A completely different and creative way to serve up Smashed Egg. This dish makes for a simple yet tasty dinner! Enjoy all our eggs have to offer and more, serve with a side salad of your choice. Quick and easy, this Vietnamese beef noodle soup topped with our creamy Poached Egg is a perfect winter dish to add to your menu. Using Sunny Queen creamy Poached Egg will give you the time to be creative in the kitchen. Our delicious Cheese & Bacon Omelette Patty is served with asparagus, fresh tomatoes and a tasty pesto sauce. Roasted Vegetable Everyday Gourmet Omelette with Spinach Salad. Made with fresh farm eggs, roasted pumpkin, fire roasted corn, red and green capsicum and grilled corn. 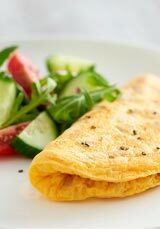 This gourmet omelette tastes great on it’s own or with a fresh side salad of spinach, red onion, cherry tomatoes, crumbed fetta and walnuts. Goats Cheese & Caramelised Onion Everyday Gourmet Omelette with Mushroom & Peppers. Made with fresh farm eggs, the Goats Cheese & Caramelised Onion Omelette is perfect with crunchy greens, marinated mushrooms and red bell peppers. A light dinner your diners will love. A must have on all menus, this simply delicious dish is perfect for a light dinner. 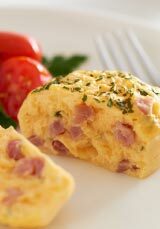 Using Sunny Queen’s Scrambled Egg Mix will ensure you get consistent and fluffy scrambled egg without any of the fuss or mess. Serve on a bed of avocado, smoked salmon, red onion and capers. Ham & Cheese Omelette with Guacamole & Fresh Tomato. Our Ham & Cheese Omelette, served with fresh tomatoes and guacamole. This is a simple and nourishing meal that will keep your diners coming back. Omelette with Pear &Asparagus Salad. Our popular Fetta and Spinach Omelette accompanied with pear and steamed asparagus. This dish has a great blend of flavours that will not only please the tastebuds but also the waistline! Our Ham & Cheese Omelette served with a classic Caesar salad. Another great meal if your diners are looking for a light alternative.